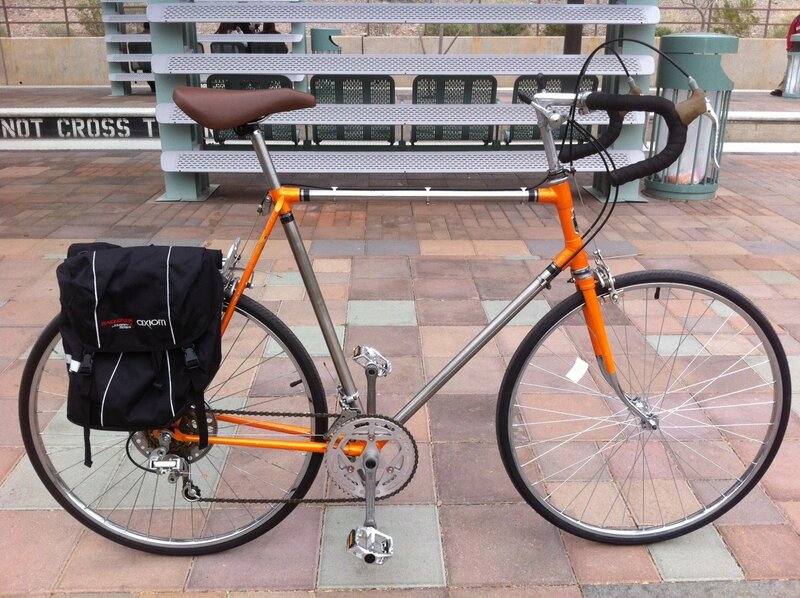 …in which I share the good news: I have a new bicycle! I decided to get a bicycle! It’s a 1980’s Kabuki bicycle made by the same people that make Bridgestone tires. The crew at The Bicycle Cellar in downtown Tempe meticulously refurbished this cycle with new cables, new brakes, new accessories, and an extended seatpost and handlebars. It’s an absolute thrill to ride! Over the coming weeks, months, and hopefully years, part of this blog will be dedicated to my adventure with cycling in downtown Phoenix. I’ll write down my hints that I’ve learned as a new cyclist, share advice I’ve learned from others, review some interesting technology, rant about the Phoenix metropolitan area’s bicycle infrastructure, and share some miscellaneous ephemera. With that, I invite you to join me on this ride. Getting to our destination doesn’t have to be solely about arriving. It’s about the journey. Put the helmet on, pack up, and let’s get moving!